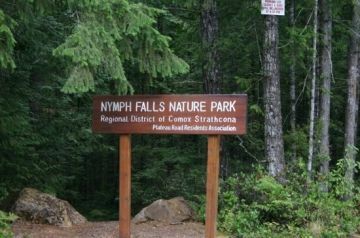 The Nymph Falls Nature Park covers over 61 hectares. Hiking and mountain biking trails exploring the banks of the Puntledge River connecting to Nymph Falls is the highlight of the park. Other activities include horseback riding, picnicking and swimming (unsupervised). Dogs are also welcome. Nymph Falls Nature Park pedestrian only trails (marked as green) include the Long Loop and River Trails. Multi use trails (hike, bike, horse - marked as purple) include the Midline and Twister Trails. Advanced mountain biking trails include the Cog the Logs and the Tree Bender Trails. A seasonal highlight of the Nymph Falls Nature Park occurs during spawning season (October and November) when visitors visit the park to watch fish climb fish ladders up the river and the falls. This natural migration also attracts wildlife enthusiasts who come to view the bald eagles and, sometimes, black bears who visit Nymph Falls Nature Park to feast on the spawning fish. Amenities on site include a parking lot, trail signs, day use picnic area, outhouses and some beaches. How to Get Here: Located on 4447 Forbidden Plateau Road (a 10 minute drive from Courtenay, BC).